4 Americans attempting golf at Carne Golf Links in Belmullet, County Mayo, Ireland on July 6, 2010. Gusting to at least 80mph, the winds carried the day, quite literally. Video courtesy of John Hom, the one in the blue jacket at the end of the video. Believe it or not, they played all 18 and all and their clubs, hats and gear survived to tell the tale, although many a golf ball stayed behind, no doubt still living the "rough" life. A rainy windy day at Carne. We still had beautiful views of this golf course. This video is taken on the 14th tee. The most difficult round of golf I have ever played. 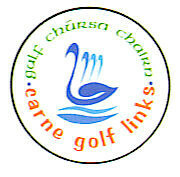 Video segment from the Hidden Links Golf Guide to Ireland featuring remote Carne Golf Links in northwest Ireland's County Mayo, thought by many to replicate the experience of Ballybunion Golf Club as it was over 50 years ago. Narrated by Renton Laidlaw. Copyright Hidden Links, Inc.